With the kind guidance and support of the Management and Director– FORE, the Center for Sustainable Development (CSD) under the Village Adoption Initiative organized a Health Camp on February 11, 2017 from 11:00 a.m.–3:00 p.m. at Kakrola village, Manesar. 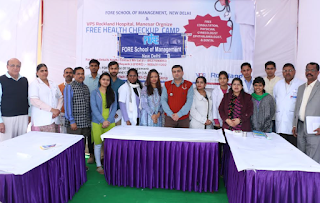 This was organized by FORE School of Management, New Delhi in association with Rockland Hospital, Manesar, with the kind cooperation and support of Mr. Faqir Chand (Village Sarpanch) and Panchayat members at their Chaupal. The FORE team, which was comprised of the Professor-in-charge of the center, administrative staff and SIG students, reached the venue and made the necessary arrangements with Panchayat members at their chaupal for the implementation of this initiative. The objective was to leverage academic and other resources to offer solutions to their problems and to help them address the issues in the area of health in their village. An initial interaction was done before the camp (with village Sarpanch and Panchayat members), and as per the feedback from the village panchayat, a Health Camp has been organized to sensitize and educate the villagers regarding health problems at the grassroots level. Among the many services offered were: Free Sugar Fasting, Free Sugar Post Prenatal, Height, Weight measurement, BMI calculation for considering the excessive fat, ECG (if required), free Bone densitometry coupons given (for checking the bone strength), and free Mammography coupons. More than 168 villagers took advantage of this opportunity and the free consultations by the doctors of Rockland Hospital, Manesar. The students from the SIG also conducted a survey with the help of the questionnaire – this was done to understand the current state of Kakrola village in the areas of health, sanitation, education, waste management, etc. The group also collected the information regarding the other NGOs and corporates who are currently running some intervention projects in the area of CSR and Sustainable development so as to plan the CSD’s future initiatives for the villagers. FORE School of Management, New Delhi is a non-profit autonomous organization. It was established as a Center for Excellence for research, consultancy, training and management education by renowned professionals of global acclaim from Government and corporate sectors. FORE has a 25 year legacy in management education and provides not only the knowledge regarding academics and the corporate world, but also mentors students to become socially aware and responsible citizens. The village Sarpanch and the Panchayat members thanked the FORE school for their efforts in organizing a social health initiative.